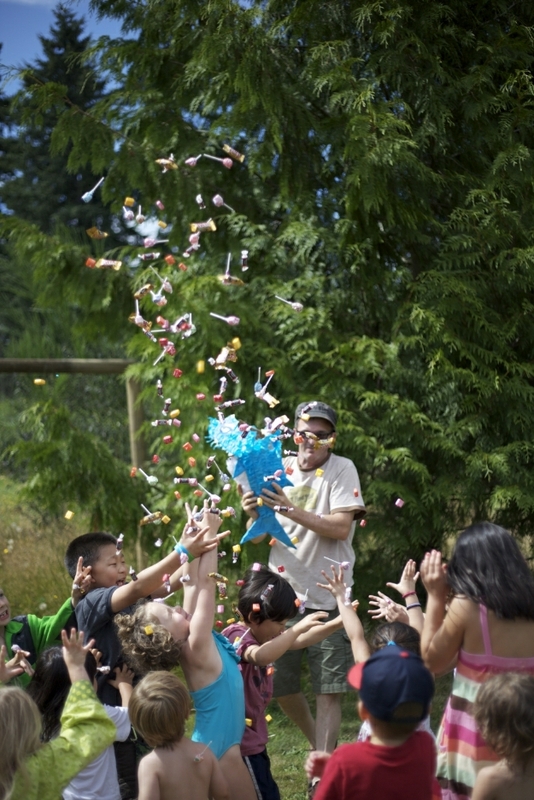 A cascade of candy, showering down from the blue sky, into the waiting hands of some of our favorite children in the world. Danny had patiently helped each child, from youngest to oldest, to take a whack at the blue-shark pinata hanging on the swing in our yard. Somehow, the birthday girl thwacked the blow that broke it open. And then Danny finished it by making the candy rain. Squealing giggles on the slip and slide. Watering the garden in the early morning, watching the patient slow turn of the sprinkler as it moves side to side. And in the afternoon, walking through to see the squash has grown again. The bags of groceries we bring home are 2/3 full of produce. I unload thick zucchinis, fat raspberries, pattypan squash, cucumbers for pickling, and more corn. Late evenings, the sun still lingering in the sky at 10. The kiddo won’t go to sleep until it’s dark. I can’t blame her. At least she knows how to sleep in now. Dinner on the back deck, every night. Breakfast and lunch too. Friends staying in our guest room, one after the other, with only a few days in between visits. Blackberry picking in our own backyard. Picnics at the beach, watching Lucy race across the sand to waiting friends, and talking with our feet in the water. Blueberry buckle. Homemade peach jam. Long mornings together before Lu goes to school. We’re painting outside on the porch, reading another book from the stack that’s always growing, hitting the t-ball again. Friends gathered on the lawn with us, talking while we watch our kids run to play in the woods together. Did she grow again? Somehow she’s taller than she was last night. This is the summer here, right now. Last year, we traveled most of the summer, speaking at conferences, promoting our book. There will be a time we’ll need to do that again (next spring). But this summer? I don’t want to miss a moment of the Pacific Northwest in July and August. Summer. Summer is here. One of my favorite flavors of summer is roasted corn on the cob. I won’t eat corn on the cob any other time of the year but summer, not because I’m a food snob but because it only tastes good in July and August. Olive oil, salt and pepper  that’s all I need. However, for a slightly more decadent treat, we’ve been making corn with lime butter and cotija cheese. This is a Mexican street food. Someday, I want to go to Mexico and eat this. In the meantime, here. It doesn’t have to be complicated: a little butter, some cojita cheese, some cayenne pepper, some lime. (I’ve seen recipes using mayonnaise instead of butter. Not for me.) Because there’s a chef in this house, he took an extra step to make this corn extra good. By making an emulsified lime butter, Danny intensified the lime taste. This also ensures that there was lime butter leftover for another batch the next day. Eating this corn  with lime juice dripping on my fingers, a bite of cayenne pepper, the cool creaminess of cotija cheese  makes these summer evenings complete. Roasting the corn. Heat the oven to 450°. Coat the corn with the olive oil. Season with salt and pepper. Put the corn in a roasting pan or skillet and slide it into the oven. Roast, tossing the corn in the pan occasionally, until the kernels are tender to the teeth, about 15 minutes. Making the lime butter. Set a saucepan on high heat. Put in the water and lime juice. Bring them to a boil. Take the pan off the heat and drop the pieces of butter, one by one, into the pan, whisking after each piece goes in. Whisk the butter and lime water together, vigorously, until all the butter has been added. The final butter should be creamy and hold together, coherently, If the butter separates at all, use an immersion blender to emulsify them again. Finishing the corn. Pour the lime butter into the skillet with the corn. Flip the corn around to coat. (You might not use all of the butter. It depends on your taste. It saves nicely in the refrigerator for another batch the next day.) Give everyone at the table an ear of corn. Top with cotija cheese, cilantro, cayenne pepper, and extra lime juice, if you wish. So true–all those big and little moments, especially the little–that add up to a fantastic summer and wonderful memories! Enjoy them all, and summer, too! That photo of Danny with candy and kids is the best photo I’ve seen in decades! Such joy, such energy, such sweetness! Happy Birthday again, Lu. Thanks for sharing, Shauna. Oh this first photo is FULL of life! And the recipe is mouth watering! Even in the dead of winter, real corn on the cob is so much better than store bought canned or frozen! I try and freeze my own at the end of every summer to carry us through the winter. Looks like a fun party! Thank you! Can you please tell us what you put on that great looking chicken and how you cooked it? I miss fried chicken. Thanks. Yes! Esquites – often made with mayonnaise. I love the emulsified lime butter – can’t wait to try that! Thanks for the inspiration. I’ve also seen it called elotes, specifically “elotes in a cup” whenever it’s sliced off the cob. It’s sooo good, I’ve actually dreamed about it. This recipe looks amazing, can’t wait to try! I LOVE the emulsion technique. Totally going to use it this weekend. And this type of corn is a staple in my neighborhood– we have a huge Mexican-American population around here and summer means everyone is throwing corn on the grill and slathering it with lime & chili powder. Yum! My four year old daughter who has celiac would eat corn all three meals a day if I let her. This recipe makes me want to do the same thing! 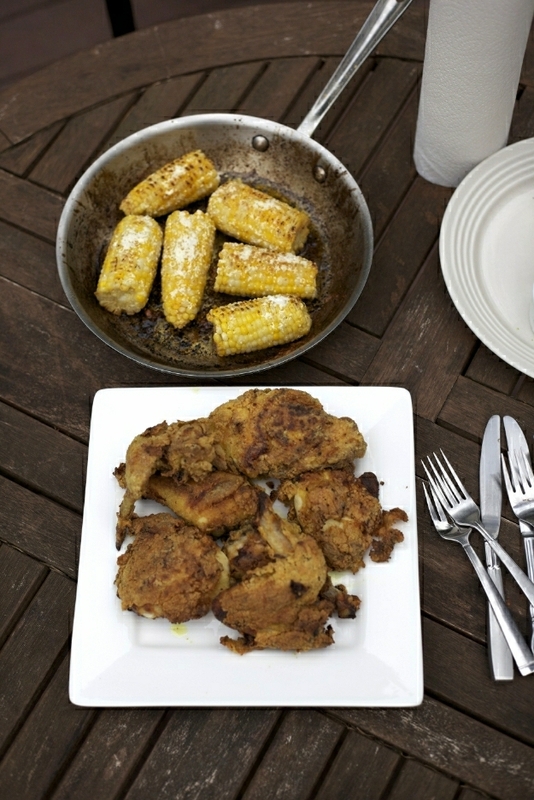 Thank you for sharing such a delicious recipe and a lovely snapshot of your beautiful summer. Now if only my daughter could learn to sleep in! We have been trying to be gluten-free since about April. I had allergy tests a couple weeks ago. I’m allergic to corn. 🙁 I already knew about my allergies to milk and wheat but had ignored that for years. I also reacted to barley, oats, peaches, shrimp, tuna, catfish,codfish, cherry, peach, onion,brazil nut and carrot (who knew you could be allergic to carrots?). One of the kids also reacted to garlic (Argh! ), tomatoes and peas. I really like your website and I found your book at the library the other day, but it seems like almost everything is off limits. Except for butter and the occasional cheat, I have been trying to stick to foods that I’m not allergic to. I am tired of itching! So my question is: do you have any suggestions for cookbooks or blogs where I might find good recipes that we can eat without having to constantly substitute. GF recipes don’t seem to work well with substitutions. I think corn was causing the worst of my symptoms. I cheated and had popcorn yesterday and I am paying for it today with itchiness. So I’m trying to avoid even cornstarch. Getting rid of HFCS has made a huge difference. I have decided not to buy anything else with HFCS. The kids don’t need that either. Thanks in advance for any advice anyone has. I did find http://glutenfreeonashoestring.com/ today and there seem to be some recipes there that we can use. try glutenfreegoddess.blogspot.com – she has a lot of food allergies. I hope you feel better, I had the same problem and after a while, I was able to incorporate a lot of things back in – just not gluten. Try looking up oral allergy syndrome as well – it turns out that was my issue, so when the pollen is high, I avoid some of the tied in foods – it helped tons! What a great picture! I enjoyed watching Lu and playmates (and the escaped pigs) running around and exploring at Dog Mountain Farm. So carefree! Yum! We love this — made it tonight as a side-dish for enchiladas (I know, corn and corn… but it sounded so good!). The acid of the lime helps cut the over-sweetness that seems to be the bane of modern corn. Great pic of Danny and the kiddos. Know what you mean about these months in the PNW… Joy. Thank you for the variation for corn on the cob. Pictures make the writing so much better. I love it… Danny made it rain! The first picture, its awesome. Everything around looks so Lively. 😀 Briliant click! The recipe, it has to be wonderful. And I am surely going to try as corns are my hot fav. This sounds so tangy tangy! Ooooh, I haven’t seen corn yet, but it must be coming soon! I can’t wait to try this. Especially the lime butter. I, too, only eat corn on the cob in August (and September up here in Vancouver) This year I am the proud new owner of a pressure canner so I am hoping to can some corn for winter eating. I pretty much haven’t eaten corn 10 months of the year for a good number of years so I have high hopes! getting corn in my co-op tomorrow…definitely going to make this — thank you!! love the pic and vivid descriptions of your summer, too. I just found out that I have a gluten intoleranz and a hitamine intoleranz too. I felt miserable for almost 3years. A couple of months ago we went to a gastroendrologist din’t want to test me either. My dad’s friend recommnede a docter and he said right away that gluten would be possible. Only I only found out that I have histamine too. that is pretty bad no chocolat no lemons oranges strawberrys tomatoes no cherrys peaches apricots mangos. I could write a lot more the only positive thing is that I know what I have now. Very impressive photo with the candy and the kids. Love it! My family recently went gluten free: My husband will love this! Thanks for sharing. I made a really tasty variation of this, inspired by a dish at a local restaurant. I cut the kernels of the cob and sauteed them in butter until they started to brown, then sprinkled with salt, pepper, cayenne. Squeezed a lime right into the skillet, then plated and topped with cotija and cilantro. So so so good! Thank you for reminding me of that amazing meal I had months ago!